Noordwolde, The Netherlands – Van Heck is world renowned for its water management systems ideally suited to the maritime and dredging industries. Van Heck now reveals its newest world premiere, a complete pump system that enables the controlled, contained, fast (fuel-) oil recovery after incorrect or ‘off-spec’ fueling and in the event of grounding or calamity at sea. 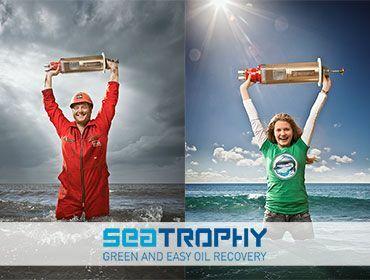 The pump, named ‘Sea Trophy’, ensures a fast, easy and well controlled solution for the removal of (fuel-) oil which will limit, or even eliminate any or all economic and environmental damages, not to mention the possible depredation of company image. Van Heck’s Sea Trophy underlines the motto ‘intervene, but not interfere’ and greatly increases the ‘Preparedness’ for any unforeseen situations, be it off-spec oil recovery or salvage. Van Heck encapsulates its innovation with the slogan ‘There is a world to win’. Everyone loses when oil is unintendedly spilt. This unique pump system can help turn the tide. Van Heck believes the Sea Trophy to be an invaluable tool for ship owners, salvors, coastguard, emergency first responders but also for those behind the scene, namely the oil companies and insurance brokers. Look at the role (conduct?) of the maritime industry in comparison to the fragile environment, especially the underwater and coastal ecology. Consider the current response plans for oil spills. Think about reducing or eliminating economic and material damages to capital goods, not to mention the conservation of company image. Contemplate the eradication any environmental impact by preventing an oil spill or ship casualty. The investment in this innovation does not stand in comparison to both the environmental and economical gains which can be achieved if the unthinkable should happen. The ‘Green and Easy Oil Recovery’ system makes a ship salvor friendly. It is the quintessential answer to new, upcoming shipping regulations such as the ‘Polar Code’ and strongly growing interests in ‘Green Shipping’. Sea Trophy tests have revealed its capabilities to quickly and cleanly remove oil at a rate of 70m3/hr @ 100cSt. This hydraulically driven pump can be used for both light and heavy oil. Its compact and manageable design (Ø150mm, length 613mm) makes it ideal for use in the most demanding situations, even onboard a listing ship. The Sea Trophy’s modest size allows entry to tanks through vent- and sounding pipes and the FOR system. The Milk can and riser pipe accessories make it adaptable for use in cargo tanks/holds and it will fit through an access as small as Ø200mm. Home Nieuws With our newest innovation there is a world to win!